For the past decade, stand-up paddleboarding (SUP) has ridden a wave of popularity, and about 3 million Americans now participate in the sport. 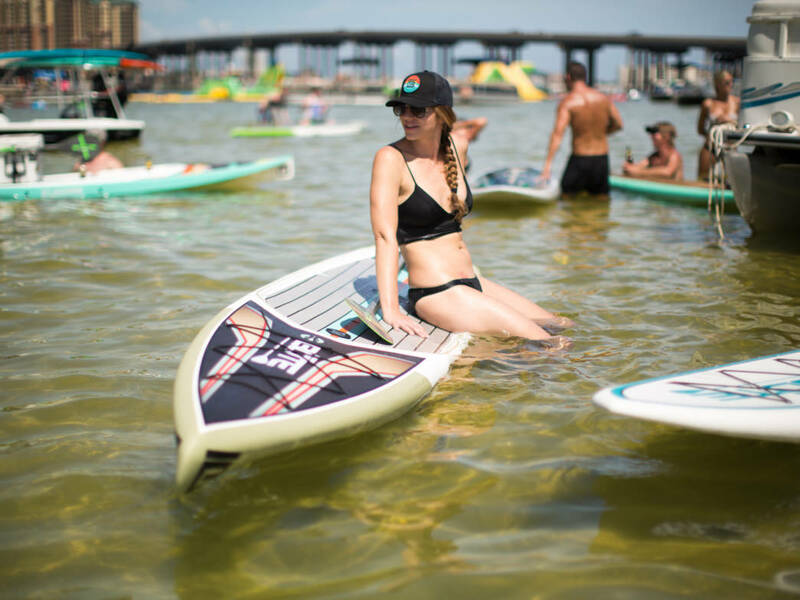 While SUP was born on the ocean waves, people in the Gulf Coast region paddle every body of water you can imagine, from back bays to lakes, rivers, and streams. As SUP has attracted more fans, it’s also matured to include all sorts of disciplines, including yoga, racing and even offshore fishing. Whether you’re looking for a new activity to get in shape, or just a fun way to spend time outdoors, SUP is great for a wide range of people. Compared to many other outdoor activities, stand-up paddleboarding is pretty easy to learn, and you don’t have to be super fit or exceptionally coordinated. Plus, you don’t have to invest a bunch of money to try it, as you’ll find plenty of places where you can rent a board and other equipment. While stand-up paddleboarding is straightforward and fun, your first outing will go more smoothly if you do a little research beforehand. 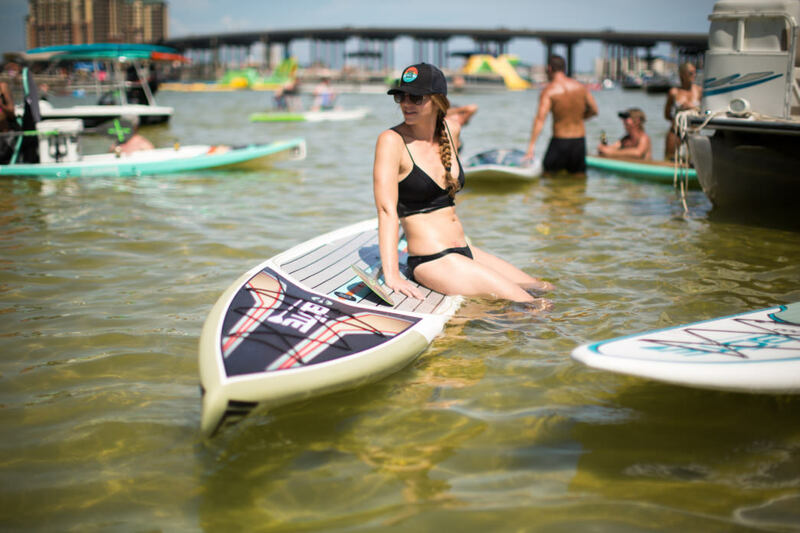 To help you get started, here are 10 tips for beginners from Mackenzie Amos, marketing and events coordinator for BOTE Paddle Boards in Destin, Fla.
Before you launch your outing, browse YouTube and other video sources to learn SUP fundamentals, such as how to choose the proper length paddle. Plus, experts in videos will demonstrate how to get on and off the board easily, where to stand on the deck, and how to use your paddle to maneuver the board efficiently. You might have visions of surfing a beautiful wave during your first SUP experience, but it’s best to begin on flat water, whether it’s a calm sea or placid lake. While most boards are very stable, you need some practice to develop your balance, and it takes skill to actually ride in ocean surf and negotiate river currents. If you do begin on a lake, stay near the shore at first, so you can avoid wakes from boats. Also, steer clear of the main channel to keep your distance from boats. If possible, find a cove or inlet with shallow water. At first, you might fall off your board a few times, and it’s much easier to get back on the board if you can stand up in the water. If it’s windy where you plan to paddle, you should probably plan to go another day. When it’s windy and the water is choppy, it’s much more difficult stabilize yourself on a board. Plus, paddling against the wind, requires much more strength and stamina. In fact, if the wind really kicks up, you’ll probably have to sit on your board to make any progress. Often, you can avoid wind by going out early in the morning. When people first try new activities, they can waste a lot of energy and get tired quickly. Until you improve your technique, it’s harder to relax and move efficiently. With stand-up paddleboarding, you might face the same issue. When you’re standing on the board, bend your legs, avoid locking them, and try to relax. This will allow you to roll with motion of the water, rather than fighting against the elements, which could wear you out. When you first try SUP, you’ll probably feel it in your thighs and core. If you’re not especially fit, you can get fatigued after about an hour. So, don’t plan to be out multiple hours for your first trip. If you rent your equipment, most outfitters will have a package that allows to paddle for an hour or less. Laws regarding life jackets, or Personal Flotation Devices (PFDs) differ by location, but in many places stand-up paddleboarders must wear a PFD, or at least carry one on the board. According to the U.S. Coast Guard, paddlers 13 years of age or older must have a Coast Guard-approved Type I, II, III or V PFD, though it can be carried on the board, rather than worn. Children 12 and under must wear their USCG-approved life jacket. If you use an inflatable belt-type PFD, it must be worn. It’s also a good idea to use a leash, which is tethered to the board and attaches to an ankle. If you’re not wearing your PFD, and you fall off your board, the leash will help you reach the board and use it to keep you afloat. Without the leash, your board can easily sail away due to wind and currents. On your board, you not only get direct sun rays, but also rays reflected from the water, so it’s wise to wear sunglasses and ample sunscreen. Many SUPers will wear a long-sleeve top made of lightweight, synthetic fabric. When you’re exercising in the sun, it’s critical that you drink fluids. Some paddleboards have bungee cords where you can stow a water bottle, but you could also wear a belt that holds bottles, or a CamelBak-style pack with a reservoir. If you’re visiting the Gulf Coast, you’ll find a wide variety of great places for stand-up paddleboarding. Here are a few favorites, including a lake, a lagoon, a stream and shallow ocean waters. Little Lagoon: Located on the border of Bon Secour National Wildlife Refuge, Little Lagoon offers 10 miles of shallow water with an easy current. If you’re looking for peace and quiet, this is a perfect destination, because few motorized boats venture to the lagoon. It’s a popular spot for SUP fishing and kayak fishing, and it’s a prime place to view migratory birds. Redneck Beach: Don’t let the name fool you. This nook underneath the Destin Bridge on Okaloosa Island is an attractive destination with ideal conditions for beginner SUPers. Off the beach you’ll enjoy clear, calm waters that not only draw the paddleboarders, but also swimmers and snorkelers. When you take a break and relax on the broad beach of sugary sand, you’ll have a great view of Crab Island and the nearby harbor. Lake Shelby: Part of Gulf State Park, this 900-acre freshwater lake feeds into Little Lagoon and provides a primitive setting for paddleboarding. As you explore the lake, you wind among islands thick with cattails, sea grass, large oaks and cypress trees. As you paddle, keep your eyes peeled for Osprey, as this is a popular nesting area. For beginners, this is a convenient destination because you can rent boards and other gear in the park. Plus, there’s a picnic area with pavilions where you can break for a snack or lunch. Just be aware that you might encounter winds and occasional strong currents in the lake, so ask park officials about conditions before you paddle. __ Crab Island:__ If you’re looking more of an adventure, and a bit of a workout, paddle out to Crab Island, which is only accessible by watercraft. More of a sandbar than an actual island, this patch of land at the mouth of Choctawhatchee Bay is surrounded by turquoise water that’s about waist deep. Once you’ve reached the island, you can feast on sandwiches and ice cream from floating food vendors, and listen to a band playing on a floating stage.